This charming, spacious beach house with private pool/spa is located in the heart of Destin on the Emerald Coast, an easy stroll from one of the most beautiful beaches in the world! With four large tastefully decorated bedrooms, three and a half baths, full service kitchen and plenty of space outside (approximately 1700 square feet of covered wrap-around porches), this is the perfect house for summer entertaining or relaxing with your family. Our bright and airy home large rooms, crown molding, private baths and balcony access for each bedroom. The rooms are large and on three levels-- we have a queen convertible bed on the first level, one king in the master, a queen bed and two singles on the second and full size and a single on the third level. Please E-Mail us for more detailed information on our home. The private pool and spa includes raised decking with trellis and brick pavers. Also outside you will find inviting upper and lower wraparound porches, circular driveway, extensive tropical landscaping, a yard, outdoor hot shower, and private rear deck with gas grill. 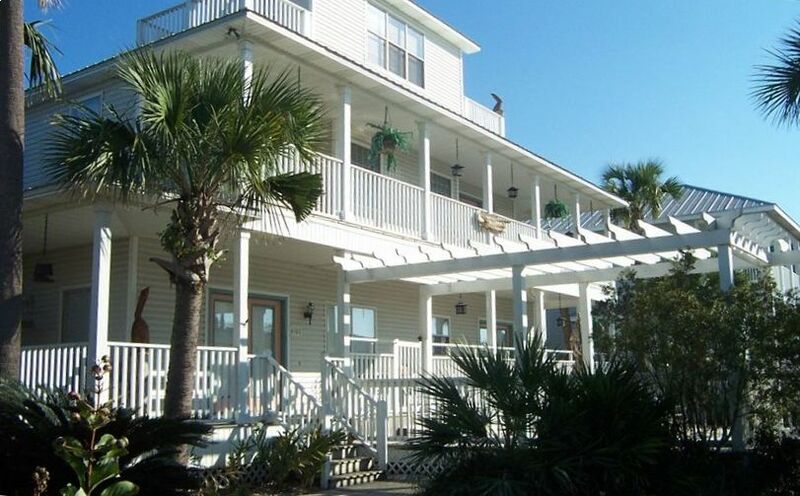 The two 3rd-story open decks provide panoramic views of the Crystal Beach area and peek-a-boo views of the Gulf. This home is situated in the center of the Crystal Beach community away from the crowded condominium complexes, a short walk to the beach (just under two blocks to the beach access) and all new shopping. The new 'Destin Commons' shopping plaza is just a couple of blocks away on Highway 98. The entertainment complex includes theatres and many shops and restaurants. You must be 25 or older to rent this home. Enjoyed the stay at the house. We had no issues with anything within the house other then we couldn’t find a broom or vacuum to clean up. I ended up leaving a new broom and dust pan in the house for your next guest. Enjoyed vacation but home could use maintenance and upgrading. PIctures are from another time period, needs upgrading.Although we had a great vacation and liked location to beach access loved private pool. We had several families stay in this beautiful large home. Plenty of room to spread out. Loved the outdoor space and close proximity to beach and shopping which was nice. We had a small issue with the pool, but when the owner was notified was corrected right away. Would stay here again. This house is close to beach and local stores. Pool in front great for relaxing after being at the beach. Owner very responsive to any questions or concerns that we had. Highly recommend. We had 9 adults and 2 children , 10 and 8 and was very accommodating. The pool was the best part because all you had to was go outside and the beach was close to. The property itself needs a little maintenance, the pool lights were not working when we arrived, they had to come out drain the hot tub and put them in. Then he heated the hot tub as we requested and it went into the pool, but we were able to figure it out. The skimmer for the pool had several holes in it, we put duck tape on it so it could be used to clean the pool. We bought a gas grill brush and clean it up. The jacuzzi tub in the master bedroom did not work, the light over the tub was out and another light bulb was missing. Light didn't work in another room, but the lamps did. I;m sure it has all been fixed by now. Nothing terrible, but needs a little maintenance and we really enjoyed ourselves and would recommend it as it is close to everything. The ceiling fans were covered in dust. The master bed on the second floor had been peed in. Called the housekeeping supervisor Saturday night after going to bed and finding the "wet" spot. There were blankets, comforters pillows wadded up and thrown on the floor in the closet. These smelled like bad Body Oder. There was a broken chair leaned up against the wall in the dining area. There were NO bath towels, wash cloths or kitchen towels. The housekeeping supervisor came Sunday and cleaned the ceiling fans, brought towels and a new gel mattress cover for the master bed. Thru out our stay we saw several large cockaroachs. The pool lights quit working. The hot tub was not warm at all it was cold. The air intake vents on the wall going upstairs were covered in dust. The floors and living room rug were dirty. Nails sticking up on deck floors. We called the owner to let him know what was going on at his property. He was genuinely concerned and nice. He seemed totally surprised at the condition of his home.